Two years after the closure of their museum, "les Soeurs du Bon-Pasteur de Québec" make the treasures of their heritage accessible again. The public is invited to discover this rich heritage by visiting Le Bon-Pasteur, des histoires à parcourir, an unusual development project consisting of fourteen exhibition areas in the living areas of the nuns. 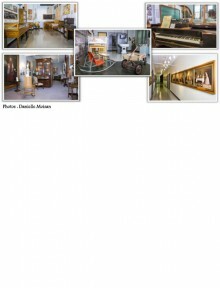 Strolling through this "inhabited museum" , visitors will discover hundreds of artifacts of the Bon-Pasteur's Collection. Saturday, September 24, 2016, 1:30 pm to 4 pm. Thereafter, the exhibition areas will only be accessible by appointment.